There has been an increased concern for preventive restorative dentistry by dentists as well as patients. Conservative amalgam restorations as a means of delivering preventive restorative dentistry does provide the patients with lifetime service of the placed restoration. Supporting the conservative approach to the preparation of cavities, Vale , had observed that teeth with narrow isthmus width 1/4 th the intercuspal distance had more fracture strength than teeth with isthmus width 1/3 rd the intercuspal distance. Black, Bronner and Ghee  from their studies reported that clinically the proximal grooves have a doubtful role in regard to prevention of fracture and displacement of restoration. However, many authors like Baum, Phillips, Sturdevant, and Marzouck ,, reported advantageous role of the grooves in increasing the retention of the restoration. The rationale involved in conservative cavity preparation is conservation of sound tooth structure and thus maintaining the strength of the remaining tooth structure. Hence in the present restorative world, extensive designing of class 2 cavity preparation is being altered and reduced in dimensions. Maintaining the integrity at the margins of the amalgam restoration is a primary goal of dentistry, and breakdown in this area leads to fracture of the restoration. Although failure at the margins appears to be an inherent characteristic in the amalgam system, it can be controlled by modifying the cavity designs. Hence, the purpose of this study is to evaluate the fracture resistance of dental amalgam restorations in various class 2 cavity designs. A total of 60 noncarious, human maxillary premolars were selected for the study. Group 1 - "Mesio-occlusal" preparation. Group 2 - "slot" preparation. Group 3 - "box-only" preparation. Group 4 - "Mesio-occluso-distal" cavity preparation. All the specimens were stored in saline. They were embedded in acrylic resin up to the cervical level. The acrylic resin was confined within a mould made from rubber base material. Dental Amalgam: Dipersalloy (Dentsply, Milford) was used as the restorative material. This alloy is an admixed alloy containing high copper, nongamma 2 spherical alloy. No 2 round diamond point. Tofflemaire reatiner and matriz band. Amalgam polishing kit (Shofu, Japan). Alter completion of the cavity preparation, each sample was rinsed with water, air dried and subjected to the restorative procedure. The specimens were subjected to a compressive axial load in the triaxial testing machine at a cross head speed of 1.2 mm/min at the marginal ridge. A proving ring (to measure the load) was placed in position. Each mounted tooth was placed at an inclination of 13.5° to the rectangular rod made of cast steel and having a dimension of 1 mm × 1.3 mm. A compressive load was applied to the restoration. The load required to fracture the restoration was noted on the proving ring. Readings were noted at the fracture of the restorations. The present study was conducted to evaluate the fracture resistance of dental amalgam restorations in various class 2 cavity designs. A total of 60 noncarious, freshly extracted human maxillary premolars were selected and were divided into 4 equal groups, consisting of 15 teeth each. Group B: "slot" preparations (conventional grooves placed from gingival floor to the axio-pulpal line angle). Group C: "box-only" preparations (long grooves placed from the gingival floor to the occlusal surface). Group D: "MOD" cavity preparations. The value of "F" is analyzed using a one-factor analysis of variance (ANOVA). The value of F is 84.898, which is very significant. Hence, a Student Newman-Keuls post hoc "t" test was conducted to find the significant differences between different groups [Table 1]. Developing a restoration that will last the patient's lifetime has long been a goal of the dental profession. Dentists decide when to place or replace the restorations. Select the restorative material and decide on methods of placing restorative material. Dental amalgam is the most widely and successfully used posterior restorative material till today. Dental amalgam has performed a valuable service for more than a century despite periodic criticism. The reasons for its popularity lie in its ease of manipulation, relatively low cost, and long clinical service life. Marzouck, Sturdevant ,, , Mondelli ,,, and other authors have reported advantageous role of retentive grooves and emphasized on the placement of retentive grooves to enhance the fracture resistance of amalgam restorations. A study on failure rate at the margins of class 2 amalgam restorations, carried out by Osborne and Gale , revealed that narrow preparations exhibited least greater at the margins, than wider preparations which had a greater amount of fracture at the margins. The present study was conducted to evaluate the fracture resistance of dental amalgam restorations in various class 2 cavity preparations. Group A ("Mesio-occlusal" preparations) with mean fracture resistance value (222.49 N/mm 2 ) had the least resistance to fracture, and group D ("MOD" cavity preparation) had the highest fracture resistance value [Table 2]. The concept suggested by Simon, Almoquist, and Markeley  recommends the use of retentive grooves to resist proximal displacement and to increase the strength of class 2 amalgam restorations. A significant difference in fracture load values between group B ("slot" preparation) with conventional grooves and group C ("box-only" preparation with long grooves) was found in the study. Group B showed more resistance to fracture than group C. Group B had a mean fracture resistance value of 490.96 N/mm 2 and group C 345.85 N/mm 2 as shown in [Table 3]. 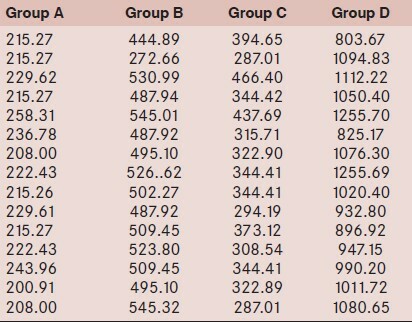 Group D ("MOD cavity" preparations) showed the higher fracture resistance values compared with all groups [Table 2]. Vale , has observed that teeth with narrow isthmus with 1/4 th the intercuspal distance had more fracture resistance than those with 1/3 rd the intercuspal distance. In this study, it is observed that the narrow intercuspal distance and the length width of retentive grooves play an important role in providing higher fracture resistance to load and thus to increase the strength of class 2 amalgam restorations. The amalgam restorations with "Mesio-occlusal" preparations (group A) had the least fracture resistance values [Table 2]. The amalgam restorations with "slot" preparations (group B) have better fracture resistance values than restorations with "box-only" preparations (group C) [Table 4]. The amalgam restorations with "Mesio-occluso-distal" preparations (group D) had the highest fracture resistance values. 1. Blaser PK, Lund MR, Cochran MA, Potter RH. Effects of designs of class 2 preparations on ressistance of teeth to fracture. Oper Dent 1983;8:6-10. 2. Larson TD, Douglas WH, Geistfeld RE. Effect of prepared cavities on the strength of the teeth. Oper Dent 1981;6:2-5. 3. Moore DL. Retentive grooves for the class 2 amalgam restorations: Necessity or Hazard? Oper Dent 1992;17:29-33. 4. Galan J Jr, Phillips RW, Swartz ML. lastic deformation of the amalgam restorations as related to cavity design and alloy system. J Am Dent Assoc 1973;87;1395-400. 5. Terkla LG, Mahler DB. Analysis of amalgam cavity design. J Prosthet Dent 1973;29:205-9. 6. Mondelli J, Ishikiriama A, de Lima Navarro MF, Galan J Junior, coradazzi JL. Fracture strength of amalgam restorations in modern class 2 preparations with proximal retentive grooves. J Prosthet Dent 1974;32:564-571. 7. Crockett WD, Shepard FE, Moon PC, Creal AF. The influence of proximal retention grooves on the retention and resistance of class 2 preparation for amalgam. J Am Dent Assoc 1975;91;1053-5. 8. Amorim A, de Lima Navarro MF, Mondelli J, Lopes ES. Influence of axiopulpal line angle and proximal retention on fracture strength of amalgam restorations. J Prosthet Dent 1978;40:169-73. 9. Mondelli J, Francischone CE, Steagall L, Batista Franco E, Ishikiriama A. Influence of proximal retention on the fracture strength of class 2 amalgam restorations. J Prosthert Dent 1981;46:420-3. 10. Osborne JW, Gale EN. Failiure at the margins of amalgam as affected by cavity, tooth position and alloy selection. J Dent Res 1981;60:681-5. 11. Berry TG, Osborne JW. Width of the isthmus and marginal failiure of restorations of amalgam. J Oper Dent 1981;6:55-8.